Somehow, somewhere I lost the notes I took during the press screening of "Madagascar," and I didn't realize it until I sat down to write this review some two weeks later. But having spent the last hour jotting down everything I could recall about the computer-animated critter comedy, I've managed to confirm one thing I do remember thinking at the time: "Madagascar" is largely forgettable. A screwball adventure about four animals who escape from their supposedly cushy captivity of the Central Park Zoo and eventually end up lost in the wild, "Madagascar" has good energy, fairly steady chuckles for kids (fart jokes and spit-takes galore), and a few out-loud laughs for adults, mostly stemming from hilarious homages to movies from "Chariots of Fire" to "American Beauty" to "Planet of the Apes." But eliciting more than a passing interest in the creature characters and their escapades is another matter. While the animation is creatively stylized (the animals have blocky toes, spiraled nostrils and amusing flexibility), their personalities have no panache because their voices lack verve. Ben Stiller provides a little ho-hum egoism as pampered lion Alex, who becomes panicked about coping with life on a tropical island where the foursome crash-lands after falling overboard from a ship taking them to a Kenya preserve. Chris Rock voices antsy zebra Marty, whose itch to explore leads the critters into entertaining episodes in Times Square and Grand Central Station before they're captured and put on that ship in the first place. David Schwimmer and Jada Pinkett-Smith are a hypochondriac giraffe and a sassy hippo who get more than they bargained for by searching Manhattan for the runway zebra. Unlike the vocal talents used in Pixar cartoons (imagine any "Toy Story," "Monsters, Inc." or "Finding Nemo" character, and you can still hear their voices), the celebrities cast in this DreamWorks production bring nothing distinctive to their roles. 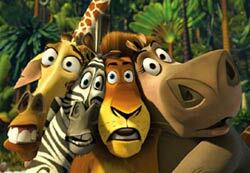 While Rock's high-pitched impishness is a good match for Marty the zebra, whose embrace of feral freedom drives urbanized Alex the lion crazy, the most memorable characters are an incidental passel of prison-thug penguins who are also zoo escapees, voiced by the picture's producers and directors (Tom McGrath and Eric Darnell). On the jungle island, the zoo animals befriend a tribe of wacko lemurs (whose slightly more distinct voices include Ali G, Cedric the Entertainer and Andy Richter), but the story arc focuses on Alex fighting the resurgence of dormant hunting instincts so that he doesn't eat his friends. The cop-out solution arrived at by writers Mark Burton and Billy Frolick simply values one kind of animal over another. Suffice it to say one shouldn't watch this movie back-to-back with "Finding Nemo." But on the other hand, doing so would certainly make it clear why "Madagascar," while amusing enough for a cheap Saturday matinee, doesn't have the originality, the style, the heart, the ageless humor -- and especially not the unforgettable characters -- required to stand the test of time.